When the temperature starts to drop, nothing beats a glass of eggnog. Well, nothing except a glass of eggnog with a little splash of rum. If you’re a fan of that combination, you’ll love our new Spiked Eggnog Fragrance Oil. It has notes of vanilla, nutmeg, caramel, and rum. 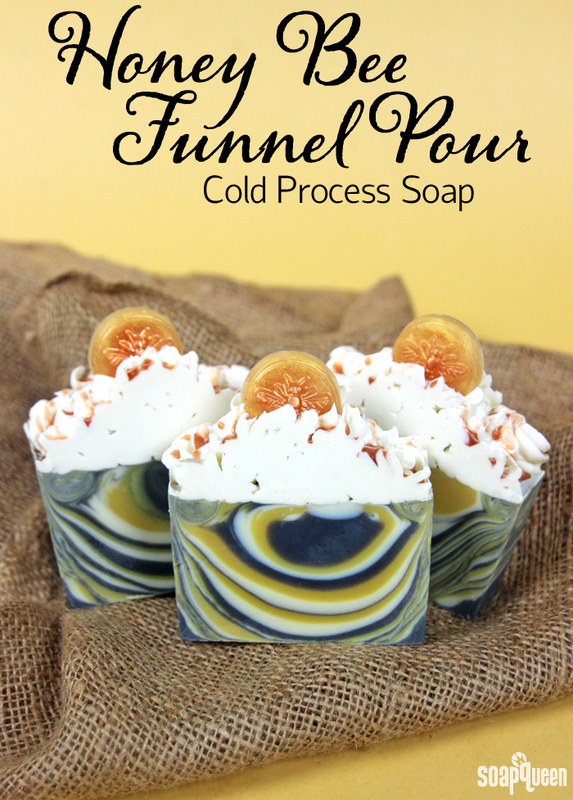 Those warm and comforting notes inspired this Eggnog Cold Process Soap. The base is made with fresh eggs, which add a creamy feeling to the bars. Then, shredded soap is added for texture – you can use any leftover scraps you have on hand. 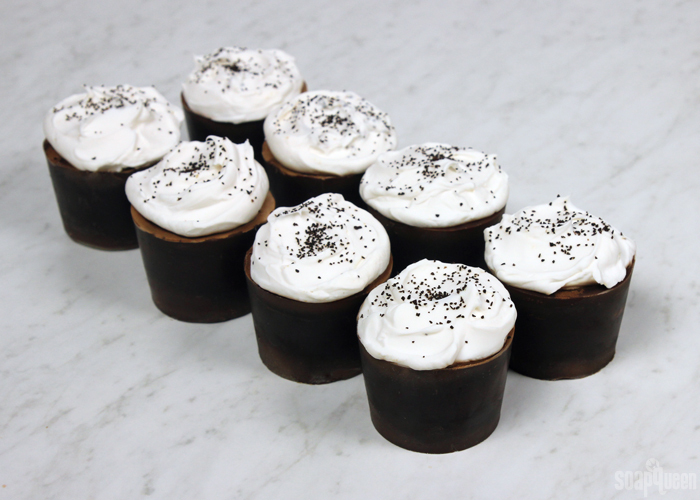 Finally, the base is topped with fluffy white soap and cute embeds colored with cocoa powder. The final bars make perfect holiday gifts for your loved ones. This project requires a good understanding of temperature. This soap is created at slightly lower temperatures (around 90 ° F) to prevent the egg yolks from “cooking” in the soap batter. To further prevent this, a portion of the soaping oils are slowly introduced to the egg yolks prior to adding them to the soap at trace. This helps slowly raise the temperature of the eggs. It’s a similar process to creating hollandaise sauce. The cooler temperatures also prevent the soap frosting from losing its shape and prevents extreme glycerin rivers. We did experience some minimal glycerin rivers in the soap frosting due to the amount of titanium dioxide. Learn more about glycerin rivers here. If you live in a very hot climate, you may want to place this soap in the fridge or freezer once it’s in the mold for 5-24 hours. 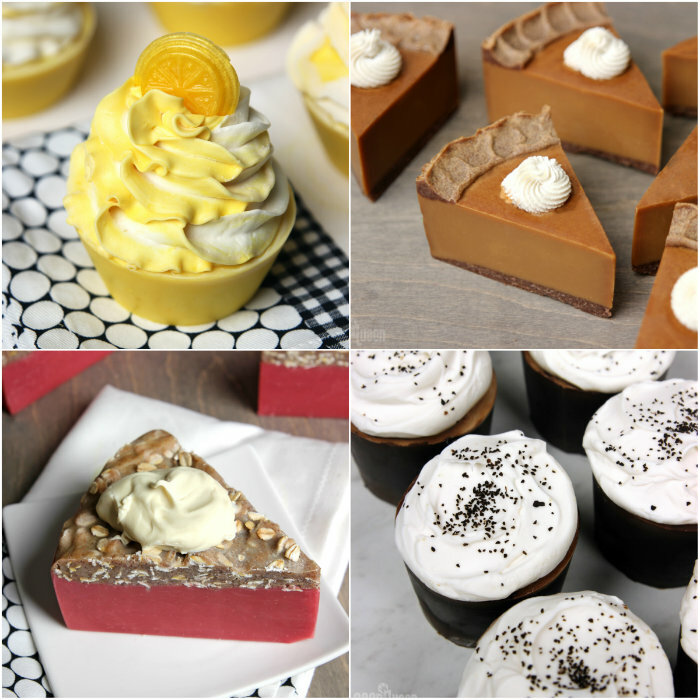 Michelle of Tea Time Creations is known for her beautiful soap cakes, cupcakes and other dessert-inspired soap. But Michelle doesn’t just sell soap! Her company offers event rentals such as tables, china, and glassware. The combination of party rentals and soap party favors sets her apart in both industries. 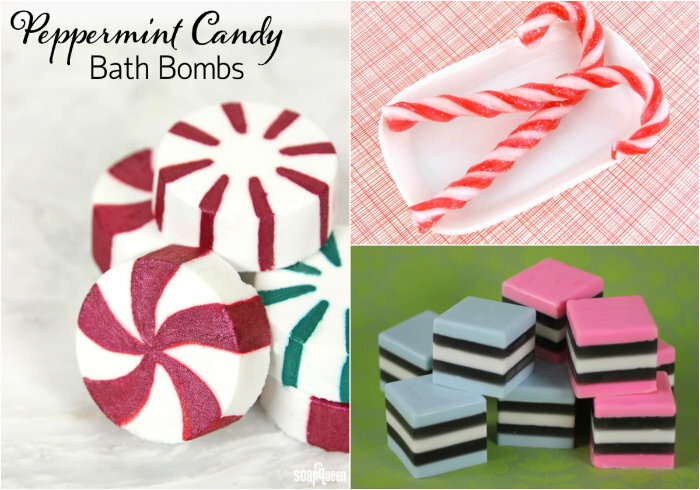 Soap makes amazing favors and decoration, so it’s a natural fit for the party industry. Read more about how Michelle’s journey in business and soaping below! As a frantically busy, trying-to-do-it-all-single mom running a household, maintaining a career as a court reporter, and raising my son, my nightly routine would always consist of a hot bath with my own special blend of essential oils to help me unwind from the daily hustle and bustle of life. Money was tight, and I was running low on my essential oils. I was looking for a way to incorporate my essential oil blend into my own bath products, instead of purchasing expensive brands in scents I really didn’t care for. I made my first batch of soap about five and a half years ago, and I was hooked. Truth be told, I may have been a bit obsessed. At first I used whatever oils I had on hand in the house and makeshift molds I found at thrift stores or yard sales. I was gifted several gallons of olive oil and several pounds of lye by someone I didn’t even know simply because I happened to be in the right place at the right time. I was able to begin soaping without a lot of start up costs. I even soaped with rainwater, because we have lots of that during the rainy season here in Florida. Can you believe this is all soap? Just look at the amazing detail! “If you fail to plan, you plan to fail.” It’s important to have a business plan, which can change over time. The best thing I did was take a micro enterprise class, which even landed me in a commercial for the program. I learned how to write a business plan, figure costs and expenses, price products, pinpoint my target market, etc. I listened to guest speakers talk about how important it is to have a professionally designed website, business cards, labels, proper packaging, and ideas on how to promote and market a business. I am very lucky that my aunt is a graphic designer, and she was able to help me with designing my website, company logo, etc. When I first started soaping, I was using handmade tags which I printed off the computer. I didn’t realize how unimpressive they were until I had a shop owner ask me to change them. Needless to say, it was a lesson learned. My aunt is now in charge of all of my printing which she does through her company. Ideally, you want your packaging and print materials (business cards, labels, etc.) to stand out above the rest, as they may very well be that “first impression” you only get one chance at. While everyone may not have access to professionals, there are free and low cost resources available through the Small Business Administration or similar agencies depending where you live. Volunteers are eager to help you succeed in your new business, so take advantage of the resources available. It’s important to take a few extra steps to ensure your business runs smoothly. If ever a “happy place” exists, mine would be an English garden filled with lots of aromatic flowers, fancy teas, and an endless amount of pastries! I picked the name in large part because in the beginning, I wasn’t exactly sure where my soapmaking would take me. I wanted a name which wouldn’t limit my creativity to strictly one product. I am taking baby steps when it comes to my business. There are so many things I want to do in the future, and I am looking forward to growing. 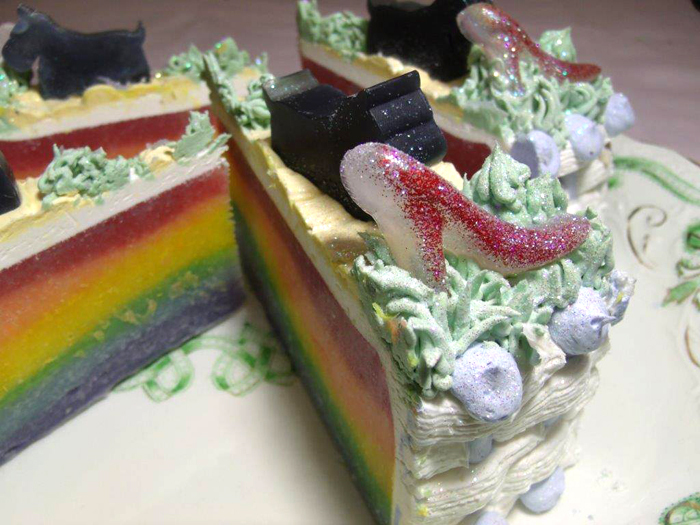 Wizard of Oz Cake Soap, complete with ruby slippers, rainbows and a dog embed. We just love your soapy cakes, could you tell us more about them? When I was pregnant with my son (who just turned 17), I took a basic cake decorating class at the local craft store thinking it would be nice to make birthday cakes for my soon-to-be bundle of joy. But just like the nursery rhyme, what I thought was sure to be a girl made of sugar and spice and all that’s nice, turned out to be a wonderful little boy made of snakes and snails and puppy dog tails. So my cakes ended up more more like Indiana Jones and dirt bikes than the Tinkerbell and butterflies I had originally envisioned. Once I noticed the similarity between soap batter and frosting, the idea just came to me in passing. 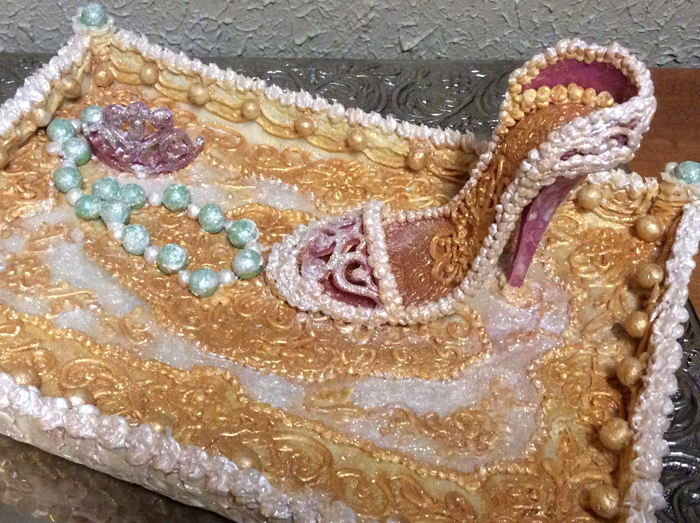 I really didn’t even know if it was possible to create a cake out of soap, let alone create some of the intricate designs which appeal to me. I was able to use a lot of my old cake decorating supplies which had been sitting around collecting dust. I used what I had on hand and I tested a lot of techniques and recipes until I came up with consistencies I was happy with. 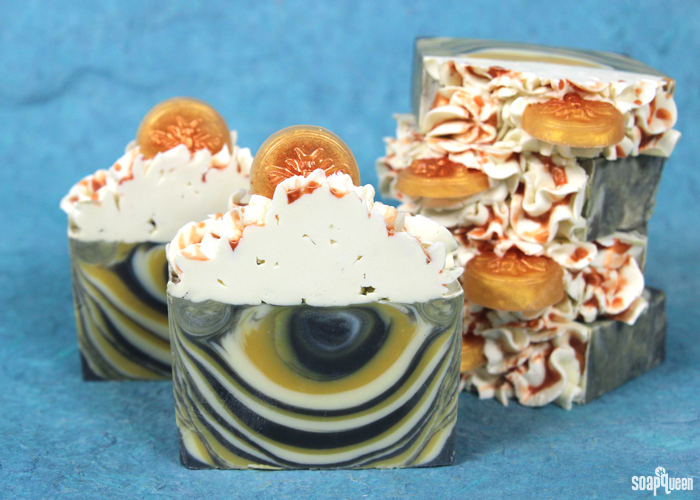 And although I make bar soaps and am drawn to the fancy swirls (which I have yet to completely master), I get the most satisfaction out of creating and designing a soap cake. I really try to push the envelope and am always excited to see the end result. Sometimes the finished product is very different than what I set out to design. It is very challenging to come up with packaging for my cakes. That is a work in progress right now. 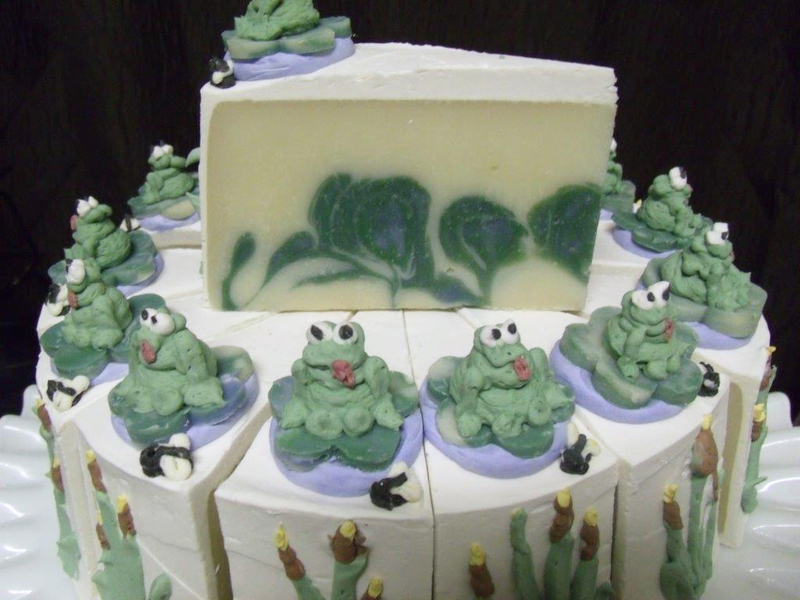 Michelle’s Frog Cake Soap; the little frogs on their lily pads are so cute! There isn’t one particular thing which I draw inspiration from. I tend to lean toward the uniqueness and history of vintage items. It may be a pattern on a particular piece of vintage china, a beaded dress in the consignment shop, or simply something random. I love honey and use it for just about anything. I get mine from the beekeeper a gallon at a time! I really wanted to make a honey oatmeal soap, so I designed a cake entirely around honey bees and sunflowers for no other reason than I like honey. My flower pot soaps were designed around a painting I liked. Anything goes! And like most soapers, some of the best ideas come in the middle of the night. What is your favorite Bramble Berry product? When I originally started soaping, I intended on only using essential oils and natural colorants. I finally gave into the temptation of Bramble Berry, and I’m glad I did. I was like a kid in a candy store. I use a variety of Bramble Berry’s products, including colors, fragrances and even the silicone liners — I hate creating unnecessary waste by continuously lining molds with freezer paper. But I would have to say by far my favorite product is the Plumeria Fragrance Oil. I love plumerias, and have several trees in my yard. During rainy season, I pick all the flowers daily and arrange them around the house. Bramble Berry’s Plumeria Fragrance Oil smells just like the real thing! Because I live in Florida, I’ve always limited myself to simply making soap. I’m happy to say that this week was my first time making bath bombs, and I love them. I can see myself easily trying several different recipes and taking lots of baths. 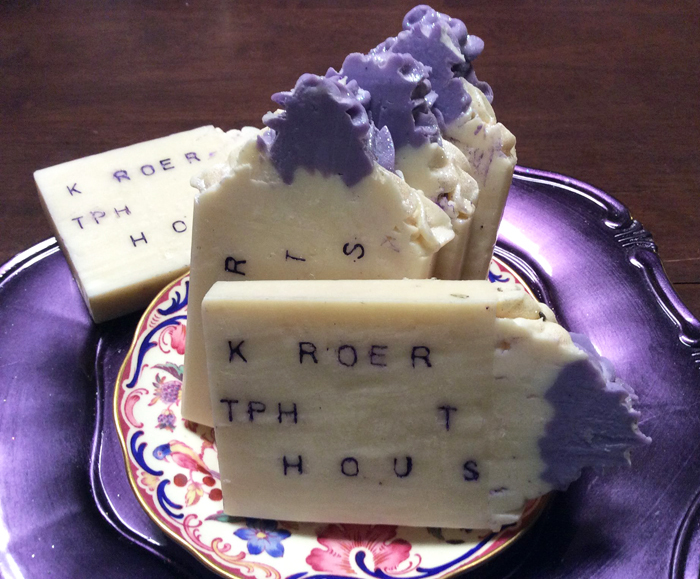 Custom ylang ylang soap created with a handmade stamp. My exercise of choice is yoga, and I even have one of “those” yoga swings. I’m not quite where I want to be yet, but I’m getting there. Sometimes I hang it up outside and do some really deep stretches. I’m out there hanging upside down, so I’m pretty sure my neighbors think I am crazy. I really enjoyed making ornaments for the tree this past Christmas. I collected pine cones, but I was especially tickled to find Shrinky Dinks in the store. I got such a kick out of watching them melt in the oven. It reminded me of my childhood. I do have a goal to learn to crochet one day. I want to make the intricate doilies. 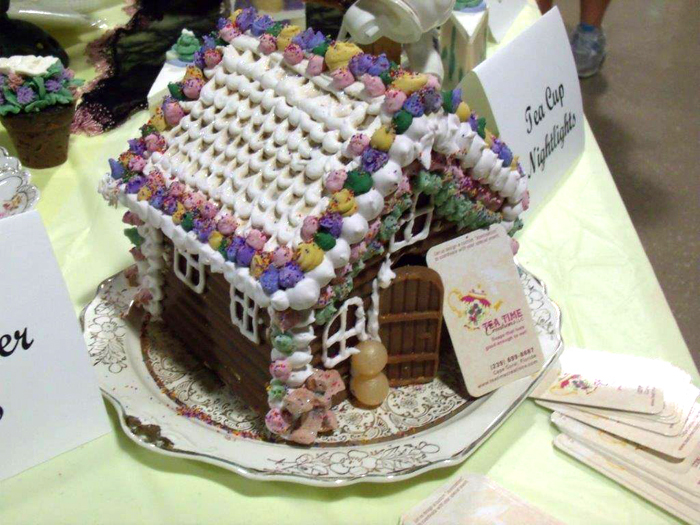 This gingerbread house is made completely out of soap! It’s sprinkled with glitter and jojoba beads. Sometimes I really want to make soap but get started too late when I’m tired. I did win the Design Mania contest, but also created a disaster in the process. I make a lot of hot process, and I make it in a pot in the oven. This particular recipe was a large one, and I couldn’t find the lid. I figured it wouldn’t be a big deal and was too lazy to look for the lid. Well, needless to say, most of my soap crawled out of the pot and continued crawling all over my oven. I learned it’s much easier to clean up the dried, cooled soap than it is trying to clean soap batter. If you need to cool your lye water down in a hurry, keep the ice cream part of the ice cream maker in the freezer. Take it out when ready to use. Fill it with a small amount of water. Then put your lye water pitcher inside of the water bath. Your water temperatures will get cold very fast. It’s similar to an ice bath, but works at lowering temps much quicker. I’m willing to bet that even if you don’t have a sweet tooth, there is one sweet you can’t resist. For me, it’s cupcakes (a close second is the Peppermint shortbread cookies my Grandma used to make me when I was a kid). But back to cupcakes, they look adorable, and I can’t resist frosting! If you have been a long-time reader, you may have caught onto my love of cupcakes from the many cupcake-inspired tutorials. But, I appreciate all sweets and love making products that are inspired by pie, candy and more. 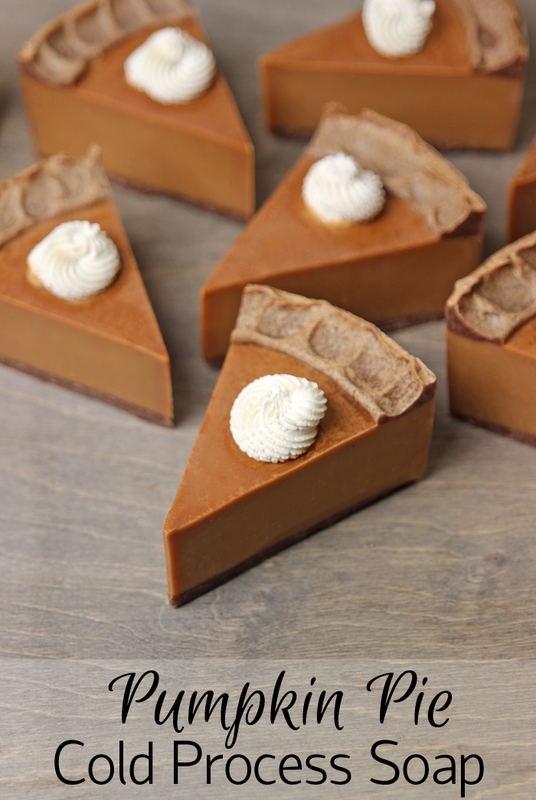 If you’d like to make your own dessert inspired project, I’ve got you covered. Like I said, cupcakes are a favorite of mine. I’ve created different variations of cupcake inspired items with everything from cold process soap to bath bombs. 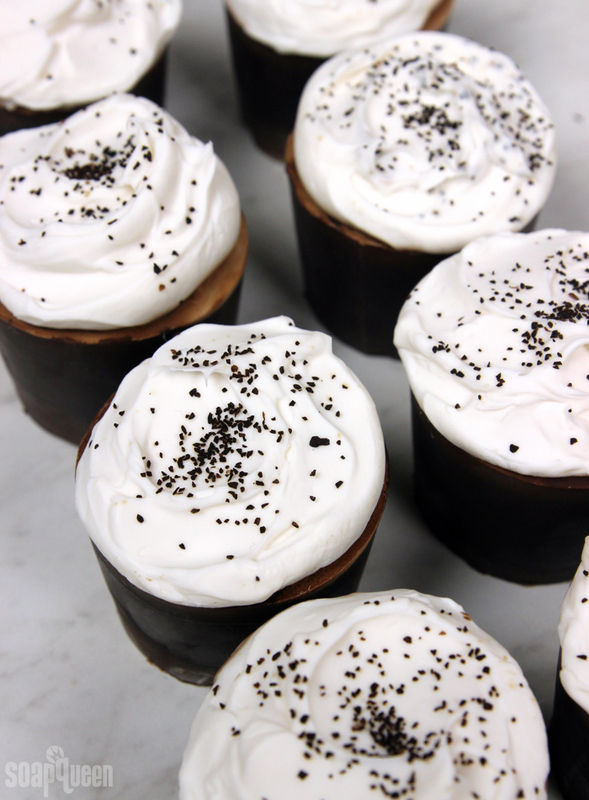 The trickiest part of creating soap cupcakes is the frosting. There are a few different methods, including using cold oil and lye. 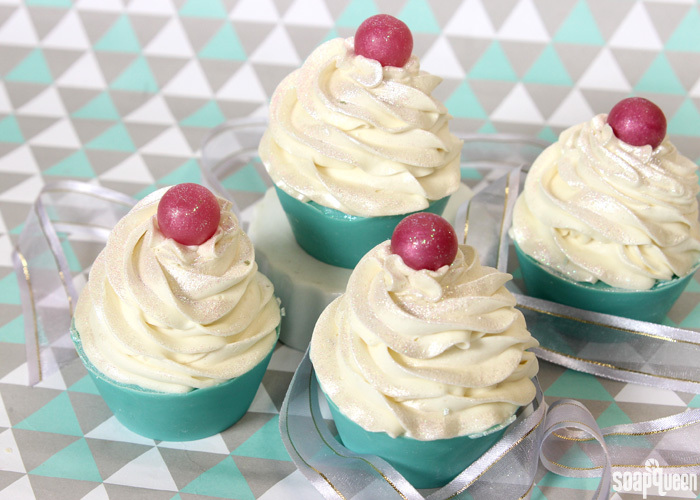 In the Sparkling Champagne Soap Cupcakes video, I demonstrate how to use cold oils and lye to create a thick frosting. Check out the video below to see the process in action. 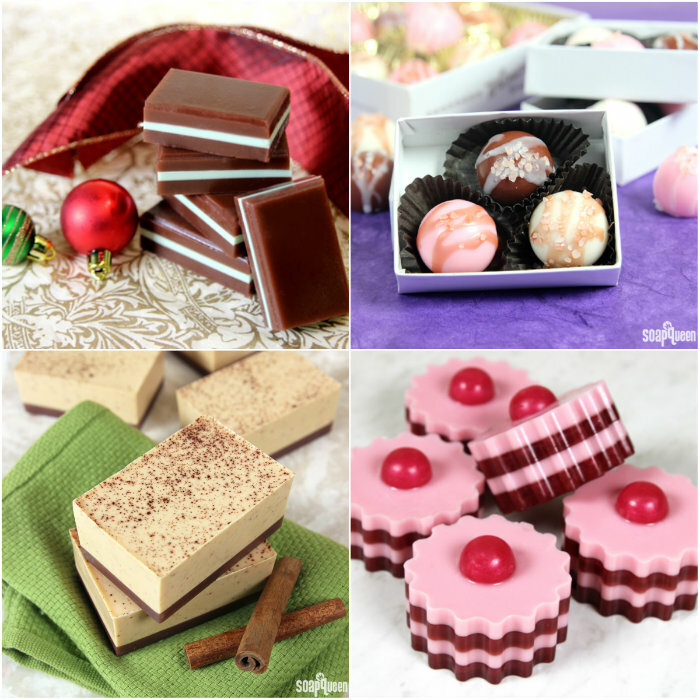 Want more tutorials using cold process frosting? In the Lemon Cold Process Soap Cupcake Tutorial, a portion of the frosting is colored with Yellow Lip Safe Mica to create a multi-colored effect. For a slightly easier method, you can wait for the frosting to thicken to a pipeable texture. 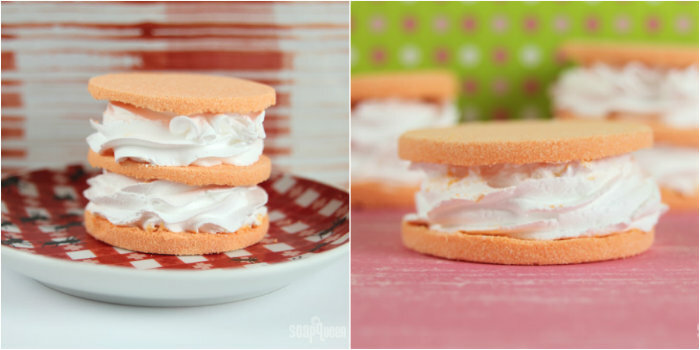 In my experience, this method works best for small amounts of frosting like “dollops” or more “messy” frosting techniques. Examples of soapy dollops are shown in the Berry Rhubarb Crumble Soap Tutorial and the Pumpkin Pie Cold Process Soap. I mean, what’s pie without a little dollop of whipped cream? 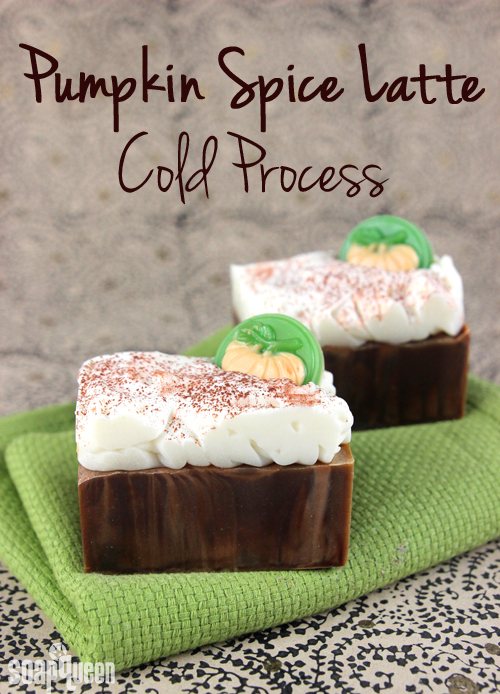 =) In the Pumpkin Souffle Cold Process Soap, thick soap is manipulated with a spoon for a foamy, messy look. 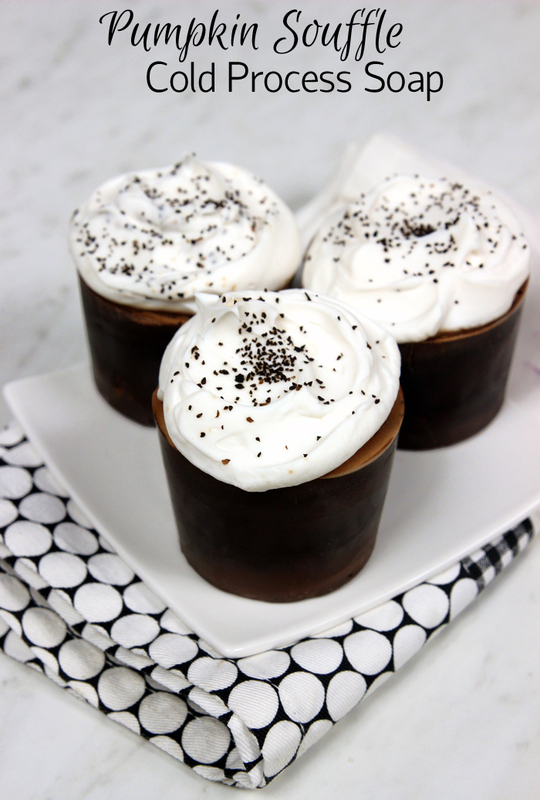 You can also create frosting for melt and pour soap. In the classic Soap Queen TV video below (made 6 years ago! ), the melt and pour frosting is created with a combination of melt and pour and Natural Castile Liquid Soap. 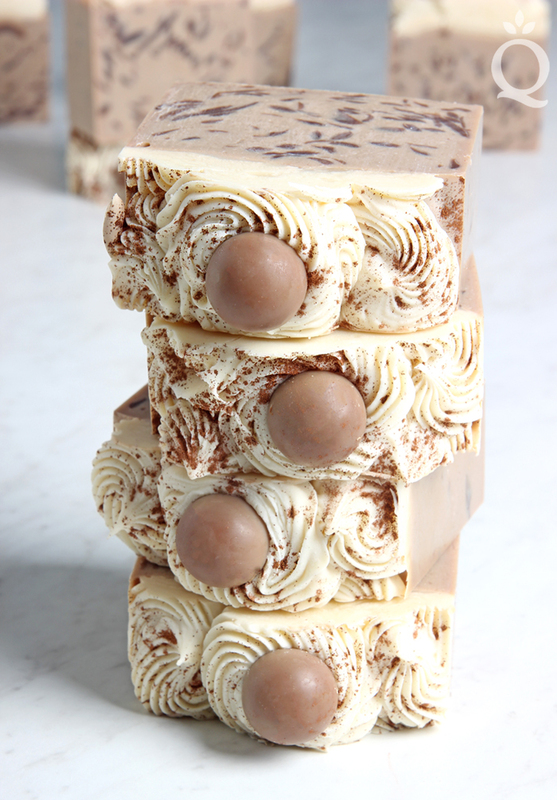 When whipped together with a stand or hand mixer, they create a unique fluffy texture that looks great. Making bath fizzies? Yup, you can make frosting for that too! 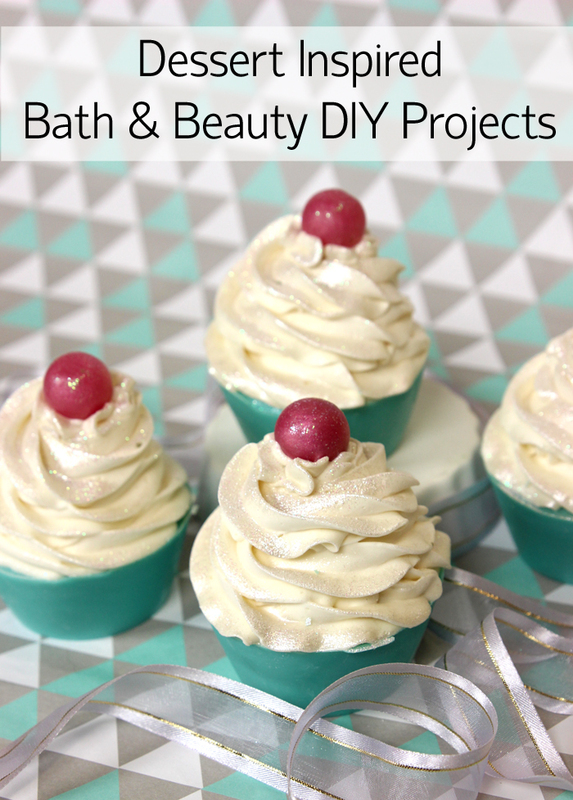 In the Soap Queen TV video below, I shared my recipe for Bath Bomb Cupcakes. The base is made with the usual baking soda and citric acid combination. The frosting is created with various ingredients including jojoba oil, SLS and powdered sugar. If you’re looking for tips on frosting your cupcakes, check out this video with Jeanee of Dirty Laundry. Another option for frosting is Foaming Bath Butter, as shown in the French Macaron Inspired Bath Bombs. 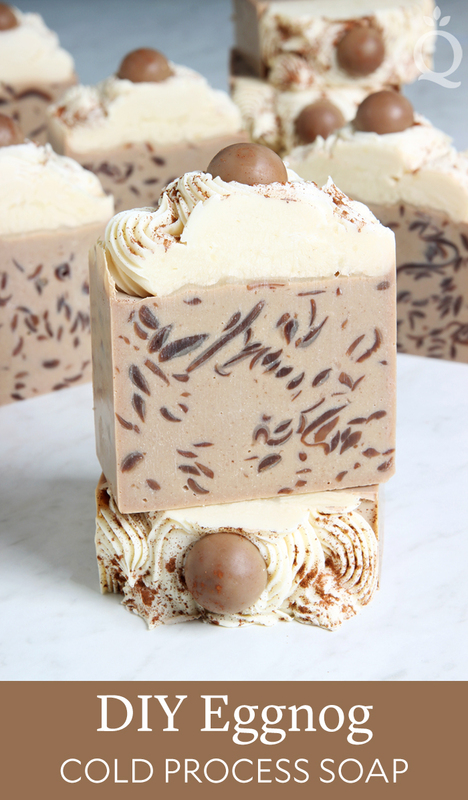 The Foaming Bath Butter is mixed with melt and pour soap, which gives the frosting a firmer texture. It’s placed in a frosting bag and piped between two thin layers of bath fizzies. Aren’t they cute? The French Macaron Inspired Bath Bombs look just like the real thing! 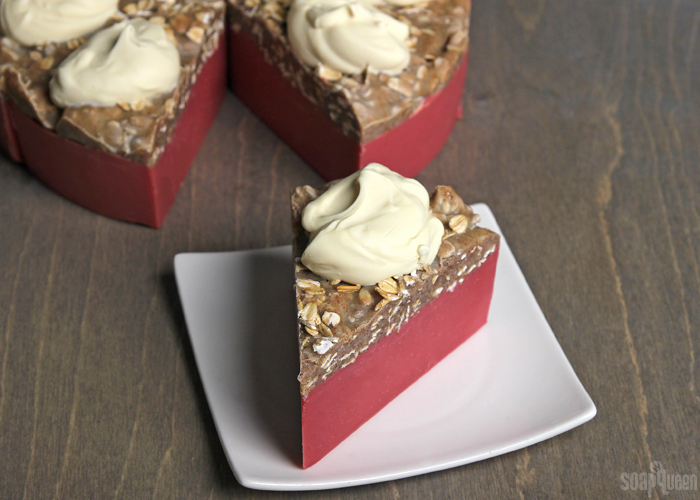 Of course you don’t need frosting to make dessert inspired soap. 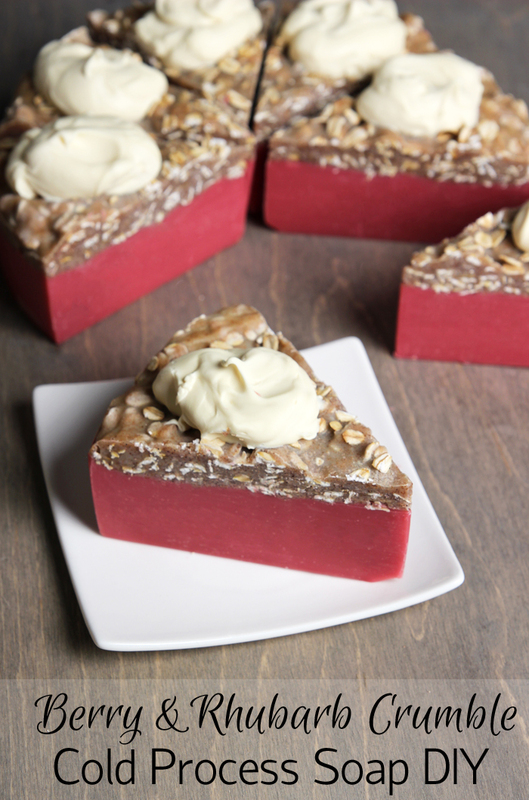 In the Red Berry Melt & Pour Soap Tart Tutorial, layers of pink and red soap are topped with a melt and pour “cherry” embed. 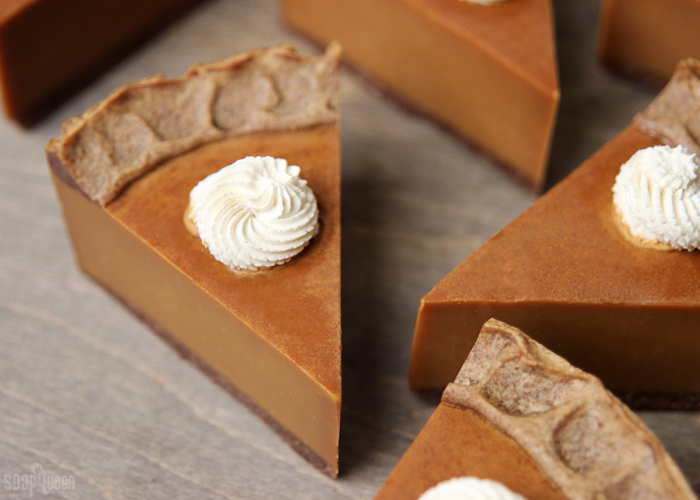 Layers of soap recreate classic mint candies in the Chocolate Mint Melt & Pour Squares, and give the illusion of crust in the Pumpkin Pie Melt and Pour Soap. 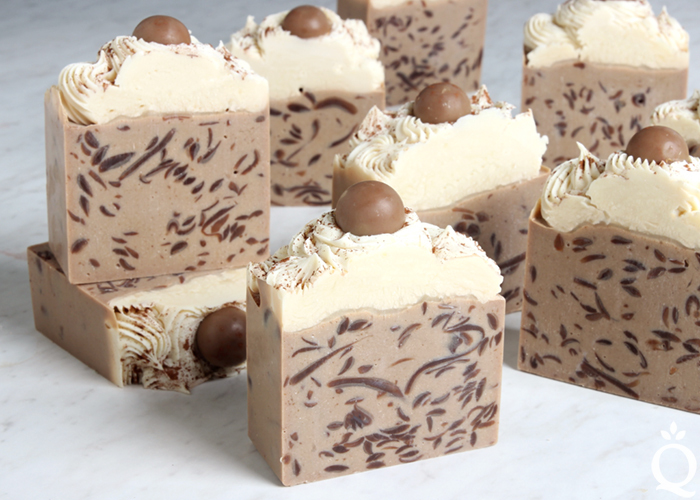 Melt and pour is drizzled on top of the Melt & Pour Soap Truffles for a finishing touch. Lemon-flavored desserts are always a favorite. Not only are they delicious, but the bright yellow color is hard to beat. 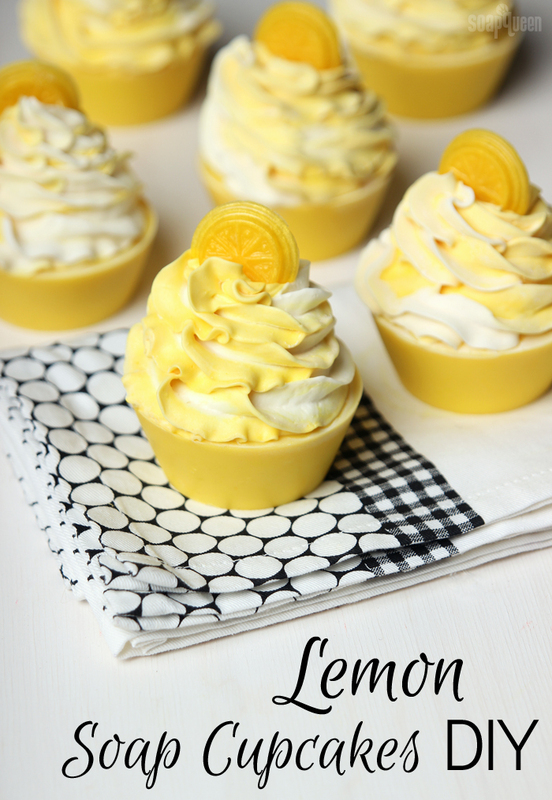 While you can’t eat these Lemon Cold Process Soap Cupcakes, they look just as yummy as the real thing! 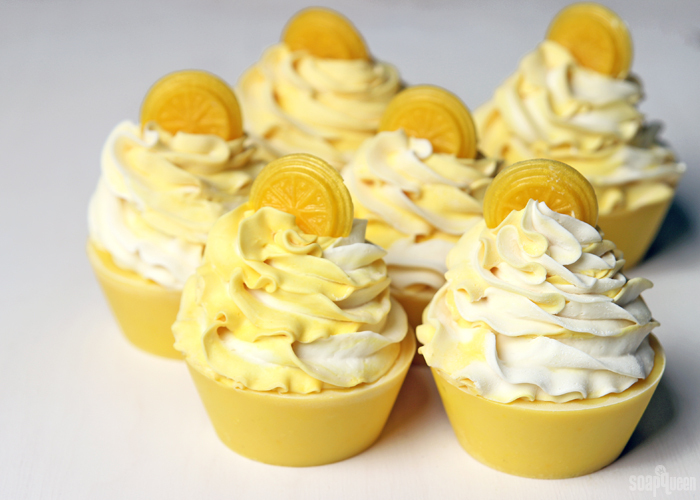 The design was a spin off the Luscious Lemon Cupcakes, which were made with melt and pour soap. Scented with Lemon Verbena Yankee Type Fragrance Oil, these soaps smell fresh and tart. 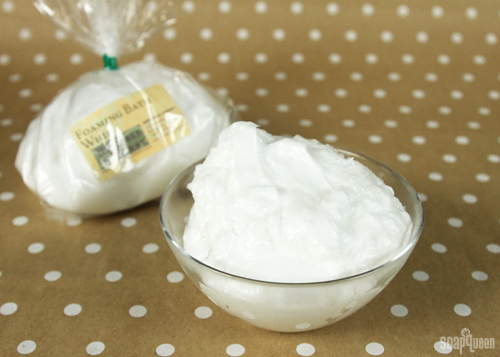 This recipe does require a few steps, and is considered an advanced soaping project. If you’ve never made soap before, I recommend getting a few batches under your belt before trying this tutorial. In particular, creating soap frosting requires a good understanding of soaping temperatures and lye safety. 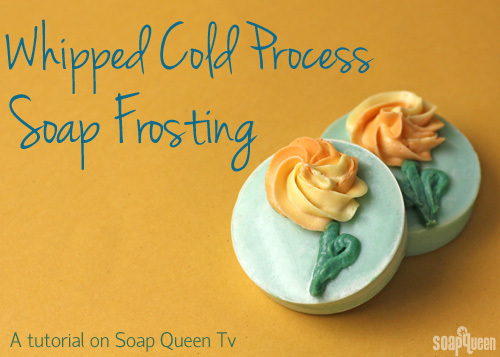 To watch the process of making cold process soap frosting, check out the Soap Queen TV video below. One of the amazing things about soap making is the wide variety of different techniques and possibilities. In this episode of Soap Queen TV, I show you how to create one of my favorite soapy techniques…cold process soap frosting! Simply whip together cool oils and lye to create a light and fluffy texture that is great for piping. 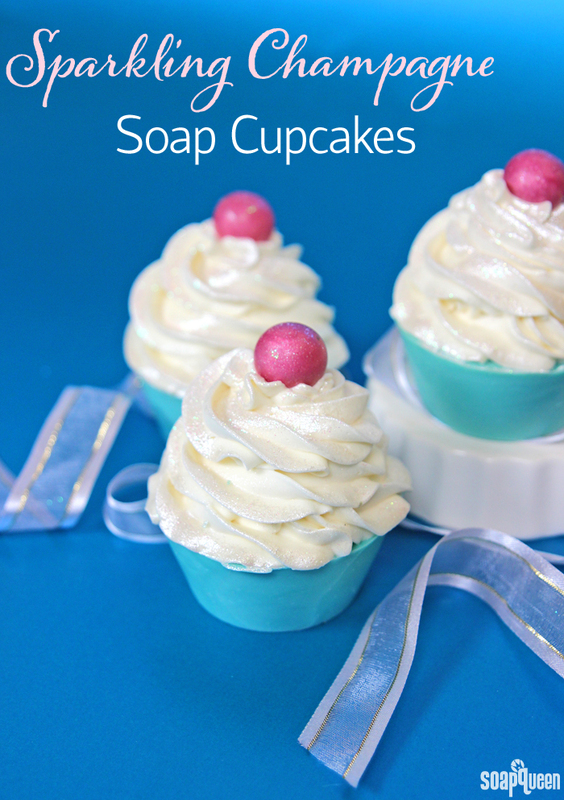 Soap frosting is incredibly versatile, and works great for soap cupcakes, or soapy flowers. 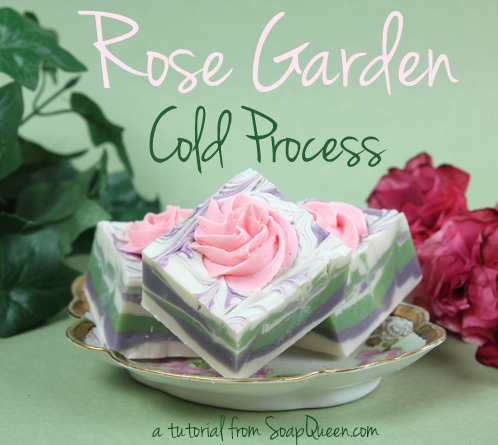 Two weeks of deals, sales and tutorials ends today with this beautiful Rose Garden Cold Process tutorial. This is a two-part recipe so it is more time intensive than other cold process recipes, but the flowery result is worth it. The first part is making the soapy roses out of cold process frosting, and the second part is creating the beautifully swirled base and topping it all off with exquisite mica painting. This tutorial combines several advanced soaping skills, including soap frosting, working with rose water lye and the hanger swirl technique, so it’s great for anyone looking to expand their soapy repertoire. This is a multi-day project; you need at least a day for the roses to be set up enough to move.